Winter Break - Outdoor Ice Skating! 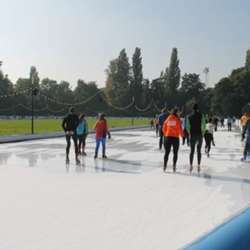 The next activity in Amsterdam: Winter Break – Outdoor Ice-skating! During the Winter when it gets dark and cold we take a break from golf and go outdoor ice-skating! We will ice-skate outdoor on a Protected content ring or a square, there is an indoor hall as well (but check if it is open), and have hot choco and soup breaks in between and afterwards. This activity is for experienced ice-skaters only and at your own risk. Dress code: Bring your own warm clothes and skates or rent them at the location. Attendees who sign up and do not show up are not allowed any other activities of the Golf Group.